The holiday travel season is near and airports will be busy with travellers. The Signal asked four travel experts for tips on how to best manage air travel this season. Holiday travellers should take care of as many details as possible before leaving, ensuring the airport experience goes as smoothly as possible. When making their reservation, they should make sure their contact information is up to date, as airlines send passengers messages in advance about travel issues. David Moore, travel agent with Merit Travel in Halifax, said a few weeks ago he was organizing a trip to Asia for a client, when he received a bad weather alert. Because of the message, he had alternate travel plans ready before the storm hit. “We could do that while they were at home and not scrambling at the check-in desks at the airport,” said Moore. Travellers should also make sure their identification hasn’t expired or isn’t expiring soon. If travelling internationally, some countries require passports be valid six or more months before the expiration date. Moore also suggests having electronic copies of all travel documents and emailing it to yourself so it’s easily accessible. Morgan Bell, a communications specialist for WestJet, said travellers should check baggage requirements before going to the airport. “Those policies are enforced during the holiday season because those planes are so full,” said Bell. If travelling with a gift, Bell recommends not wrapping it in case security needs to look at it. Bell also said passengers should be aware of pet policies. 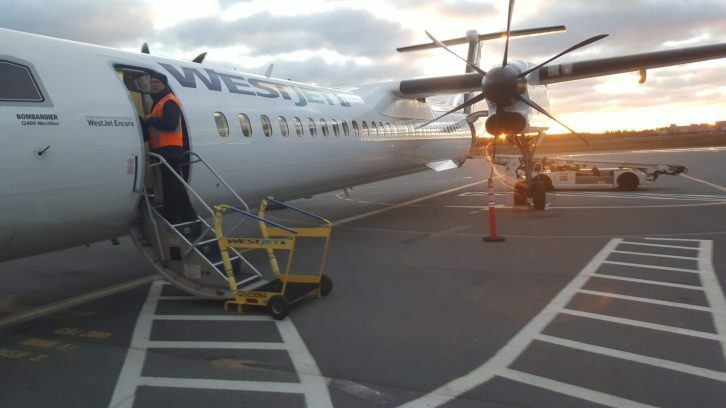 WestJet requires passengers to let them know because kennels are not allowed between Dec.15 to Jan. 6. Air Canada has similar rules. These rules do not apply for service animals. Andrew D’Amours, co-founder of a travel tips website called Flytrippers, suggests travellers get to the airport around two hours before domestic flights because of crowds. “At least get the stress out of it of not missing your flight,” said D’Amours. If you’re at the airport, some airlines use chatbots to answer simple questions, like flight statuses. Air Canada uses Alexa technology and WestJet uses Facebook Messenger for their chatbots. There are a few ways to handle possible flight delays and cancellations. D’Amours suggests purchasing a travel credit card. Airlines are not obligated to give travellers money to pay for food or hotels if they are stuck because of weather. This is because weather is out of their control. D’Amours said if a flight is cancelled, airlines would book travellers on their next available flight to that destination. It is up to the traveller to see if another airport has a route that will get them there faster. Gábor Lukács, founder and co-ordinator of Air Passenger Rights, said sometimes airlines say they can’t land because of weather. After landing, if passengers check the arrivals web page at that airport they were supposed to go to, they may see other planes can land. Therefore, this issue is related to the airline’s capabilities, not the weather. “Just because an airline says weather, don’t take it at face value, go investigate,” said Lukács. He said airlines will sometimes blame weather in another location for a delay or cancellation, but it has no impact on the flight route. Air Canada’s policy states it’ll pay up to $1,500 for baggage delay/damage issues in Canada, while WestJet will pay up to $2,100. Lukács said sometimes airlines lie about how much they actually owe passengers to bring down their costs. “The first and most important thing to know is not to trust the airline when the airline tells you what your rights are,” he said. Lukács said if a traveller ends up in a situation where they need to talk to an airline about their rights, they should remain calm. They should take out their phone and record the conversation because it is legal in Canada, without consent of the other person, as long as the traveller is participating in the conversation. The holiday travel season can be hectic. The most important tip, said D’Amours, is to remain calm and be respectful. “Just take it in stride,” said D’Amours. Correction: Dec. 13, 2018: An earlier version of this story misstated the amount WestJet will pay for damaged baggage.